The perfect stealth, mouth to lung kit by Aspire. This mod is perfect for on the go vaping either during the daily commute, relaxing at home or when stealth is needed. 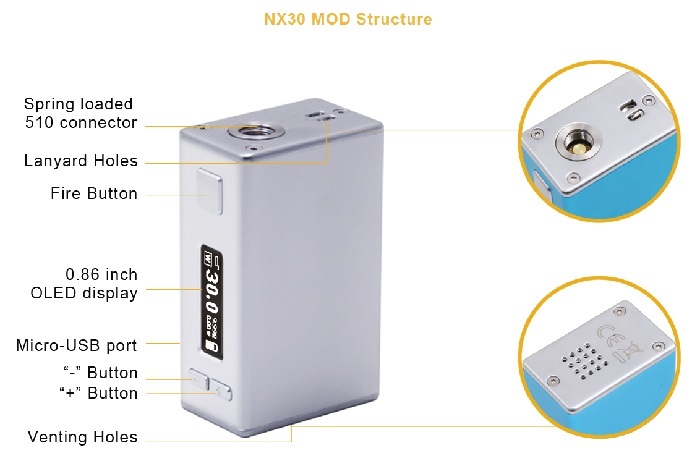 The compact NX30 mod teamed together with the low-profile Nautilus X tank allows you to vape anywhere comfortably. The Nautilus X has the new 1.8ohm coil installed to make sure the flavour is coming through in huge waves. X1 U-Tech 1.8ohm coil installed. Do not use a smartphone plug to charge this device. The output is simply too strong and can cause damage or fire hazard. Please use a suitable plug adapter such as the one shown in related products.